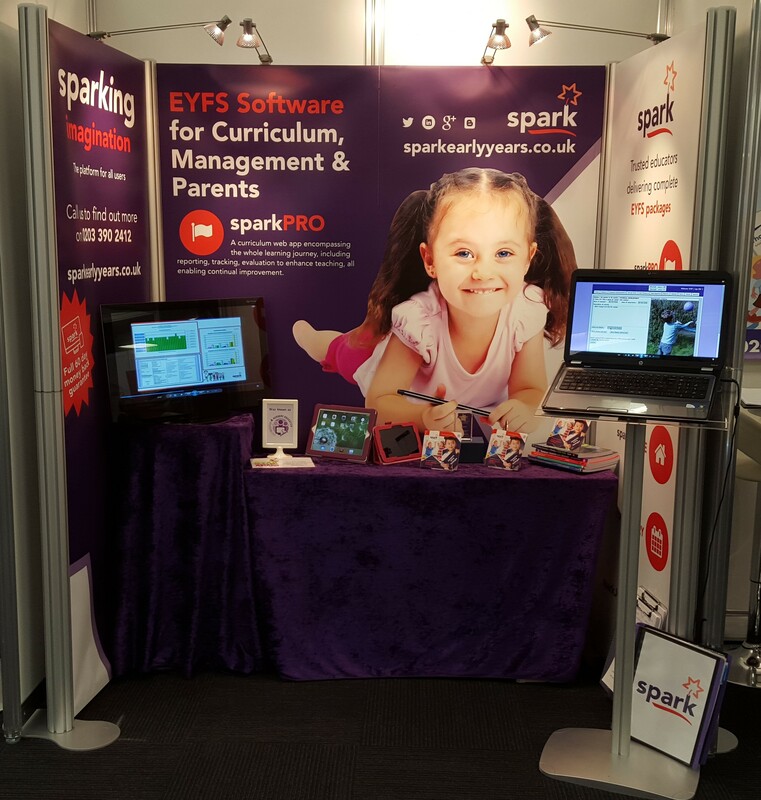 We prepare to celebrate our 8th birthday, we launched our EYFS nursery software at Childcare Expo, and we will be back again this September. I thought I would reminisce and encourage you if you haven’t been to an early years show to attend. It is amazing that we have been doing this for eight years! Thank you to all our colleagues (that’s our customers). Through a collaborative approach with them, we pull on and incorporate expertise across the country and the world, to promote the spark ethos; to provide software that aims ‘to get it right’ for every child. To do that it is vital that support is in place to minimise the various challenges of those that support the child ’s learning and development and to ensure everyone is valued and involved; parents, practitioners, apprentices, managers, directors/committees, plus external providers and professionals. Working with you brings huge job satisfaction – thank you! So Why Attend An Early Years Exhibition? Many years ago when there was just ONE exhibition, and as I initially did my NNEB in London, it was the place to go. Later, when I moved into owning my own business, I used to organise for my nursery team to go by mini-bus, then later a small coach to London once a year on a Saturday (actually it may have been a Sunday). We all came away exhausted with plastic carrier bags of leaflets and a wish list. As a nursery proprietor, I would plan my ‘get list’ before the trip and often would wrangle and get a bargain on the last day of the show. One year I got a modular climbing frame, another a ball pool; the coach was an asset! Now, there are shows throughout the year in different regions of the country. Why come? It is more than an ‘all in it together feeling’, we have so much in common, don’t we? It supports the ‘looking to do our jobs better’ principle for the children and families we care about. It is exciting to see new resources and how the catalogue companies display their EYFS enabling environments; to discover ideas and I always take some photos to share. The latest ground breaking idea is something that might be handy to have or know about in the future! I can see it, touch it and possibly hear and smell it. At the last show, I even had a ‘nursery dinner’. Much better than a catalogue and maybe a more informed decision can be made to buy or not to buy, and I might get a discount or win it. By checking out the websites or show guide, I might enjoy a competition or free prize draw and walk away with a biro or two. I find new ways of doing things; presentation, improvisation and always come away with, ‘we could try that’! There is also lots to hear. Like-minded people are discussing their finds or with the exhibitor; maybe I am nosey. There are eminent speakers and workshops so; it is best to plan well ahead to ensure I get a place or get to the designated spot in time. It is good to listen to the latest trends, to the research and take away ideas and thoughts generated by those inspirational people often known as ‘experts’ in their slot. I never thought forty odd years ago I would be exhibiting myself one day! There is always a build up to a show and great excitement once we have set up on the spark stand. We love talking to folk, to learn and discuss the current EYFS challenges. At the shows, we don’t exhibit I often go anyway as it is so worthwhile and I can be free to do the things I can’t do when attending to a stand. Do come and find us on the spark stand and have a chat, whether it is Coventry, Manchester or London. Collectively there is loads of early years EYFS experience on our stand! It’s good to see people again, to meet new folk, to chat, to empathise, to share and to continue to learn.